We all have things we’d like to tell our teen selves (my list is miles long… Don’t worry about what other people think, Teen Katy!). 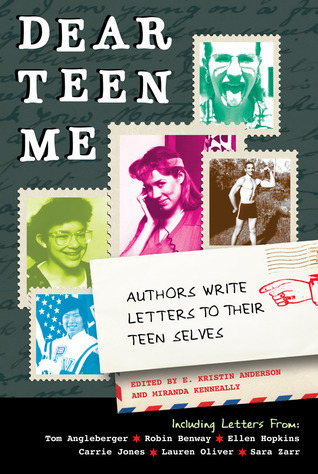 Because of this, a group of young adult authors have compiled letters to their teen selves in a book called Dear Teen Me, published by Zest Books. From Goodreads: DEAR TEEN ME includes advice from over 70 YA authors (Lauren Oliver, Ellen Hopkins, and Nancy Holder, to name a few) to their teenage selves. The letters cover a wide range of topics, including physical abuse, body issues, bullying, friendship, love, and enough insecurities to fill an auditorium. So pick a page, and find out which of your favorite authors had a really bad first kiss? Who found true love at 18? Who wishes he’d had more fun in high school instead of studying so hard? Some authors write diary entries, some write letters, and a few graphic novelists turn their stories into visual art. And whether you hang out with the theater kids, the band geeks, the bad boys, the loners, the class presidents, the delinquents, the jocks, or the nerds, you’ll find friends—and a lot of familiar faces—in the course of Dear Teen Me. What six words of advice would you give to your teen self? I wish someone would have told Teen Jess to save money. That’s a good one! Thank you so much for being a part of this, Katy – and of course, for helping spread the word, too! It’s because of amazing and talented writer friends like you, that I was even able to pull this off – so thank you! I love what you chose to tell your teen self. This is such an awesome idea. Off to check out the video!